It was a long flight home (well not really…just 5 hours) but it sure seemed longer. I had a wonderful time with family and friends in Virginia. 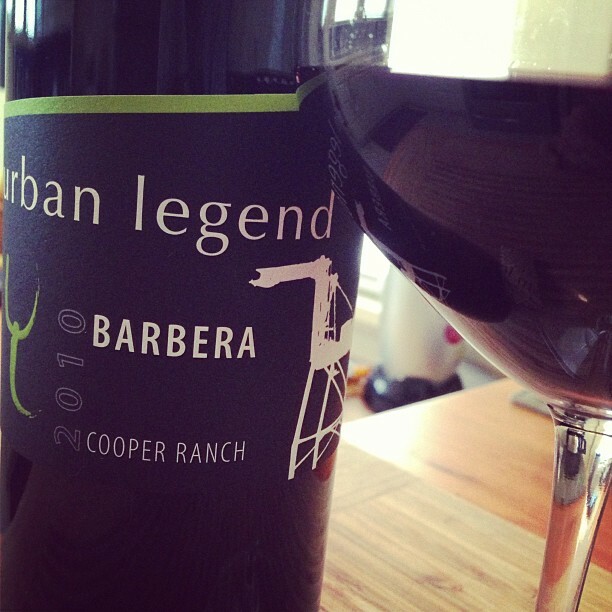 Finally home and settling in to relax while watching a little TV, (I needed to catch up on Major Crimes) I decided to open the Urban Legend 2010 Barbera. I couldn’t wait to taste a glass of this Barbera simply because it was great when I had it at the winery. The Urban Legend Cellars is located in Oakland, CA. Marilee and Steve Shaffer are the owners and wine makers for Urban Legend. Like other small wineries, they have a great story. Marilee’s past careers include academic research to discover effective bacterial vaccines, development of molecular cloning methods, and biotech equipment sales engineering and marketing. (what a mouthful that is!) Marilee has an exhibit at the Smithsonian…how cool is that!?! After many years in this career and creating her own business called Waypoint, Marilee decided it was time to launch a new business…in the wine industry. Steve holds patents in computer system and fiber optic networking. Together they make some awesome wines. This winery is definitely a hidden gem in Oakland, CA. If in town, you absolutely should visit them! The 2010 Barbera had a slight floral aroma with cassis and dark fruit. On the palate was dark cherry, plum, anise (or some might say licorice), and even a little cola, light tannins, very good acidity and a long finish. I thoroughly enjoyed sipping on this wine while watching Major Crimes!! !